This post appeared on The Huffington Post on January 10, 2010. Recent research released by the Women’s Philanthropy Institute (WPI) at the Center for Philanthropy at Indiana University that revealed American women are more likely to give to charity than men (in most cases twice as much) has been generating big buzz through mainstream and social media (Women Give 2010). For most these stats are eye-opening about the role of women in supporting the charitable sector in the United States. 1. 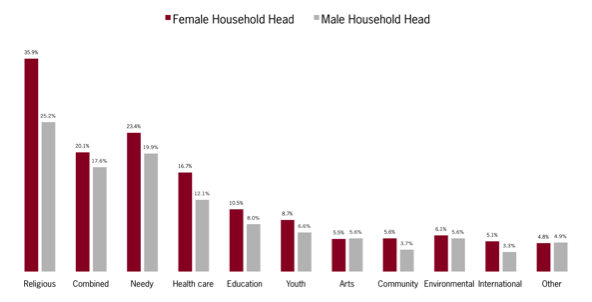 Female-headed households are more likely or as likely to give as male-headed households in every charitable subsector. 2. Women are significantly more likely than men to give to international, community, religion, health care and youth and family causes. Notable is women’s disproportionate support for charitable giving across the globe. Women are 55 percent more likely to give to international causes although less than 6 percent of both men and women support these causes. This research is not only beneficial to those trying to engage American women as donors. It is also helpful for women themselves to see their gender’s giving patterns and tendencies. Giving by women obviously doesn’t end at the U.S. borders. A November 2010 white paper by Barclays Wealth, “Global Giving: the Culture of Philanthropy,” reports, “men are more active philanthropists in developed countries, but in emerging countries, women take the lead.” Women around the globe are engaged in philanthropy and asking important questions about how to advance it. Jackie Butcher wanted to understand who volunteers in Mexico so she conducted a national study. A member of the Junior League of Mexico since she was 18, her volunteer experiences led her to pursue a Ph.D. to better understanding how and why people volunteer. According to Daniela Nascimento Fainberg, “Brazil is a happening place for philanthropy” today. Her experience is that gender is not a major factor in Brazil; Brazil is still a “macho” culture. The global philanthropic landscape is changing and we need to learn more about it to further engage women. The Center on Philanthropy at Indiana University is hosting the symposium, Women World Wide Leading through Philanthropy, which will focus on how women lead, give, and connect through philanthropy around the globe. Two dozen speakers from six continents, including the women mentioned above, will explore this rich and vibrant landscape with sessions ranging from gender differences in giving in Great Britain, family philanthropy and the next generation, and marketing campaigns to build new audiences to leadership issues, celebrity philanthropy, and women’s philanthropy in China. International philanthropy is a hot topic today. Women World Wide Leading through Philanthropy, will explore one facet of this growing field – the role of gender in giving, volunteering, and leading through philanthropy worldwide. Does gender matter in philanthropy around the world? How do women create a place at the philanthropic table in a “macho” culture? How does gender affect family philanthropy worldwide? What models of charitable organizations do women favor?